Our trusted fittings are available in a whole new design! 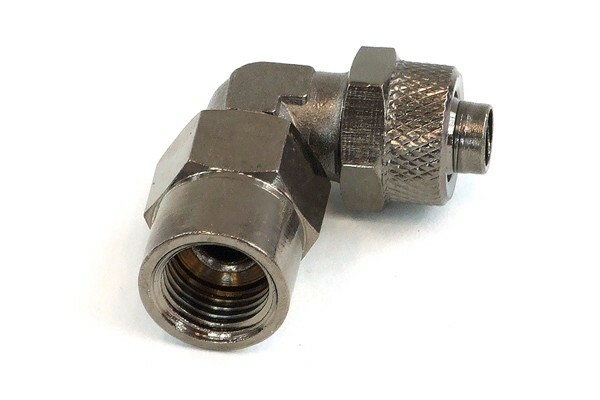 Robust high-quality fitting with cylindrical inner thread (G1/4"). The hose is fixated by a union nut to ensure a tight and quick seal which can be released which can also easily be removed with one hand. This system ensures maximum safety and ease of installation. Without O-ring seal! This fitting is additionally angled by 90° and freely revolvable which makes it perfect for application on Chipset or graphics card waterblocks or other applications which may profit from an angled fitting such as DIY projects. Thread size: inner thread G1/4"
Important: Please use Phobya Thread sealing tape to seal the thread!! !